Queensland Art Gallery and Gallery of Modern Art (QAGOMA) already claims to have “the best collection of contemporary art from the Pacific anywhere in the world”. But the Brisbane gallery’s holdings will be boosted even further by acquisitions from its ninth Asia Pacific Triennial of Contemporary Art (APT9), according to its co-curator Zara Stanhope, the Courtauld-educated curatorial manager of Asian and Pacific Art who was appointed last year. The acquisitions, funded by private philanthropists, will include new work by some of the most dynamic and socially engaged artists of countries including China, Cambodia, Iran, Bangladesh, Laos and the Marshall Islands. Many of the acquired works had been commissioned for APT9, which opens on 24 November. Among items to remain in QAGOMA’s inventory after APT9 closes on 28 April 2019 will be 11 finely woven clothing mats made by women on the Marshall Islands: the first Micronesian objects to be acquired by the institution. 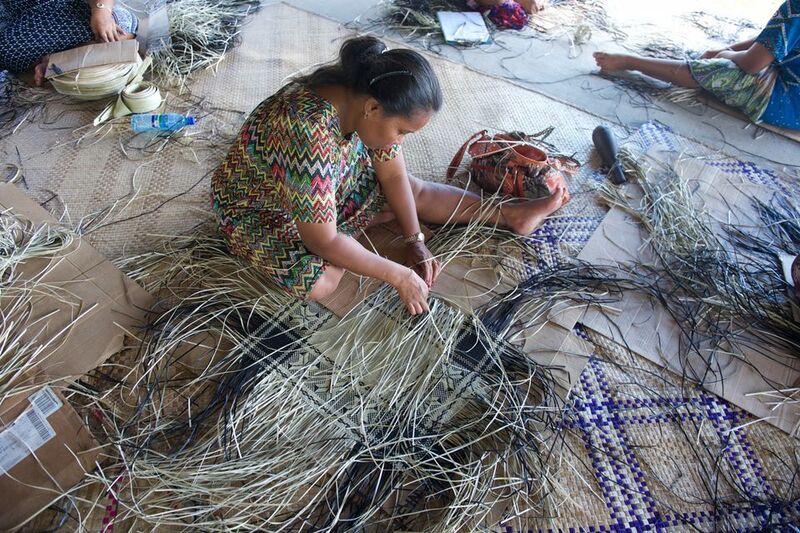 The Marshallese Jaki-ed weaving tradition has been long in decline but was recently revived with the help of the University of the South Pacific in Majuro. Traditionally both men and women wore the mats around the waist. Also being taken into the collection is a work by the Cambodian artist Vuth Lyno, which commemorates the resilience of the country’s spirituality during the murderous Khmer Rouge years from 1975 to 1979. 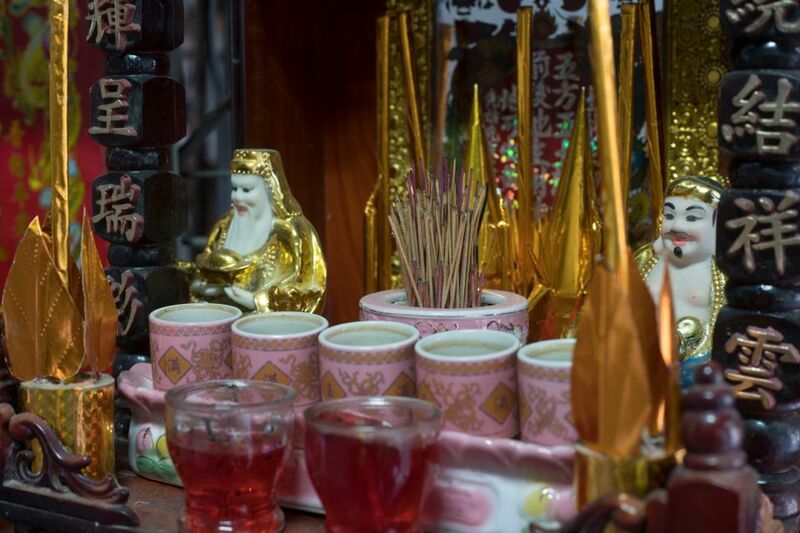 Lyno made a tower of small, domestic shrines collected from the residents of the famous White Building in Phnom Penh. Opened in 1963, its clean-limbed design was based on French minimalism and traditional Cambodian stilt houses and its 468 apartments offered low-cost housing. But the White Building residents fled when Khmer Rouge soldiers occupied Phnom Penh in 1975. The building, once a symbol of Cambodia’s modernity after its independence from France, rapidly declined and eventually provided slum-like accommodation for thousands of people. It was finally demolished last year. The theme of resilience is continued in the work of Bounpaul Phothyzan of Laos, the most extensively bombed country in the world. “There are lots of old bombs lying around and people would repurpose these,” Stanhope says. 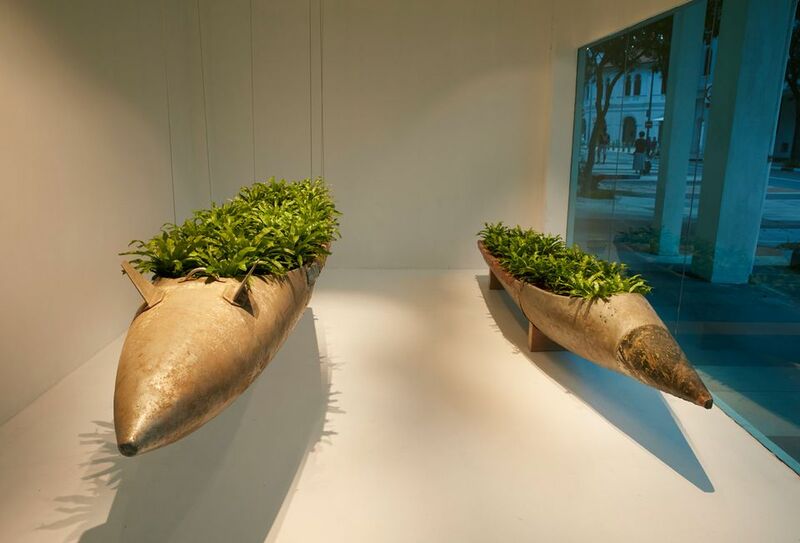 “They strip out the contents and turn them into things like canoes or supports for houses.” For Phothyzan’s APT9 work, the artist created beautiful suspended gardens by planting ferns in the bomb shells. These have been acquired by QAGOMA. 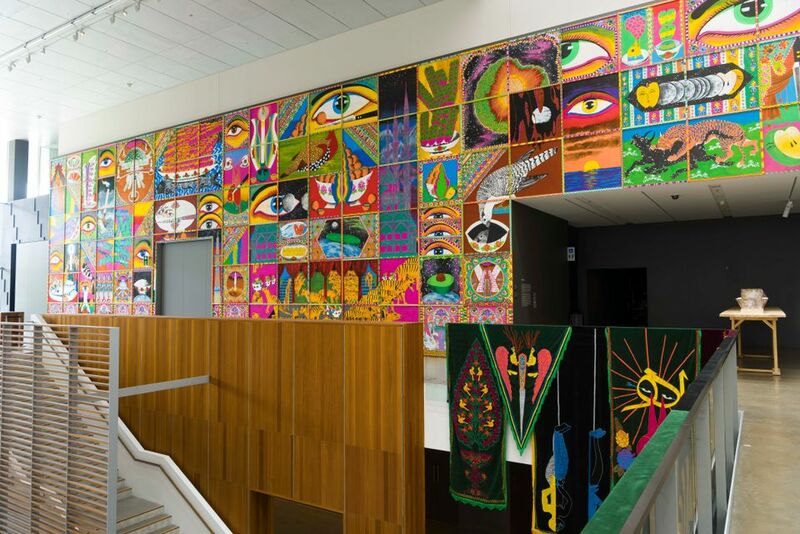 Among other works to remain in Brisbane are the intricate, gaudily coloured paintings by the Iranian artist Iman Raad whose influences include Persian miniature painting and his country’s penchant for vibrantly painted public buses. QAGOMA has also bought APT9 works by the Myanmar ceramicist Soe Yu Nwe and the Thai textile artist Jakkai Siributr. One of the most famous artists featured at APT9 is China’s Qiu Zhijie, the dean of experimental art at Beijing’s Central Academy of Fine Arts. 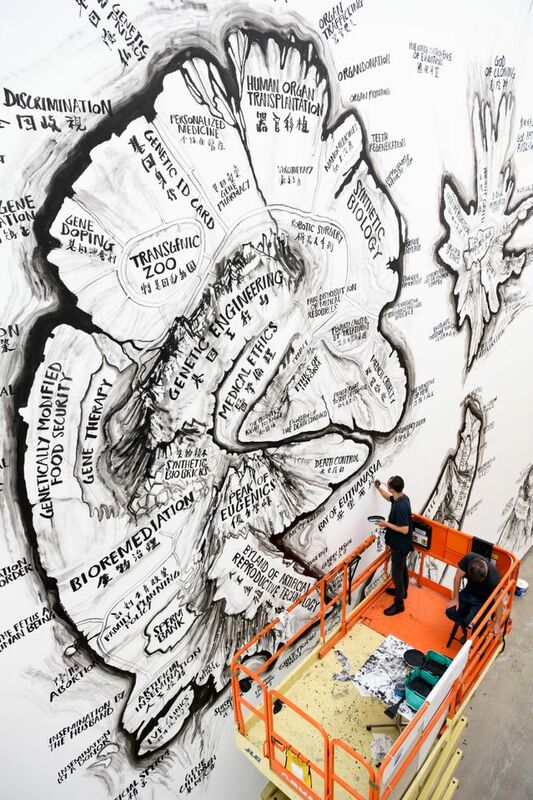 Leaning on the Chinese tradition of map-making, Qiu Zhijie has painted a Map of Technological Ethics (2018); standing 18m high and running the length of the 38m wall at GOMA, the map replaces country names with moral quandaries around animal cruelty, climate change and technology. But Qiu Zhijie’s work won’t be coming to QAGOMA. “We can't acquire it because it's a painting on the wall and it’s his largest mural,” Stanhope says.